The Exiles’ mission is to engage in a conversation of literary works of art and the truth they embody and bring that conversation into the public square. As a result, one of our chief goals is to cultivate relationships with others who share our convictions about the nature and importance of literature in the life of the well-formed person. The Exiles were formally established in the Spring of 2012 as a literary club in the venerable tradition of the Inklings of Oxford and the Fugitives of Vanderbilt University. They revere the men and women who contributed directly or indirectly to the work of these groups or to the movements in literary criticism which gave rise to their formation, including: John Crowe Ransom, Allen Tate, Robert Penn Warren, Cleanth Brooks, Flannery O’Connor, T. S. Eliot, Dorothy Sayers, C. S. Lewis, J. R. R. Tolkien, George MacDonald, and Christopher Williams. It is the hope of the Exiles that their work in poetry, fiction, and criticism persist in the grand Western literary tradition which Homer inaugurates and these our progenitors, the giants of the past century, transmit to our own age. The Exiles meet regularly to share and critique their own writing and that of others both classical and contemporary, as well as to discuss literary and aesthetic theory in general. The Exiles’ earliest origins are to be found in the initial acquaintance of two of their founding members, B. R. Mullikin and Tyler Morrison. It was while together on the College of Saint Thomas More Rome Term in January 2007 that they first came to a realization of their shared notions about poetry and literature. Over the course of the next several years, the idea of starting a literary club akin to The Inklings began to catch fire among the other students as well, as their experience of and ideas about literature were guided by the College and its Tutors, eventually reaching Thomas Beyer. Unfortunately, though, the constraints of time that necessarily accompany undergraduate study prevented the actual formation of such a group for some time. Finally, in the Spring of 2012, their degrees being completed, Beyer, Morrison, and Mullikin renewed their resolve to see a group established and set about doing so. On June 13, 2012, the Inaugural Meeting was convened at Ye Olde Bull and Bush in Fort Worth, Texas, and The Exiles were officially founded. Since then The Exiles have met frequently and seen their membership continue to swell as other former students of Thomas More and their associates with similar ideas wish to participate in the ongoing creation and discussion of good literature. The Exiles are a group of likeminded men and women who gather together as often as they can to share and critique their own and others’ writing. Their mission is to enliven the conversation and contemplation of literature in every sphere, especially by bringing to light the importance of the Western Literary Tradition in both the composition and criticism of literature. On October 25th, 2012 The Exiles published the first issue of a new literary journal featuring original works of poetry, short fiction, translation, criticism, and book reviews. 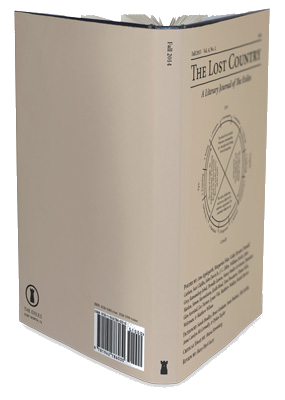 The Lost Country is the natural result of the need the members of The Exiles saw for a journal committed to the investigation of the nature and characteristics of the literary work of art in explicit regard to the venerable literary tradition of the West, and particularly as transmitted by The Inklings, the Southern Critics, and related thinkers of the past century. The Lost Country exhibits the poetic, narrative, and critical work of members of the Exiles and others who wish to contribute to the enduring life of that tradition, and it is our hope that it engage the larger literary community as well.